... It'll still be a better one than the Komets are having. I find it very interesting that the Coaches from the two teams said basically the same thing. The winning coach says if you play the "system" you will win, and the other ( the loser) says, when we don't play the system we will lose. As for the "toe dragging" that drives Graham nuts: if it were me (knowing that these guys don't make a whole bunch of money) every time a player "toe drags" and doesn't score, he is fined $50. I felt a little sorry for Will. He was bombarded early with point blank shots. 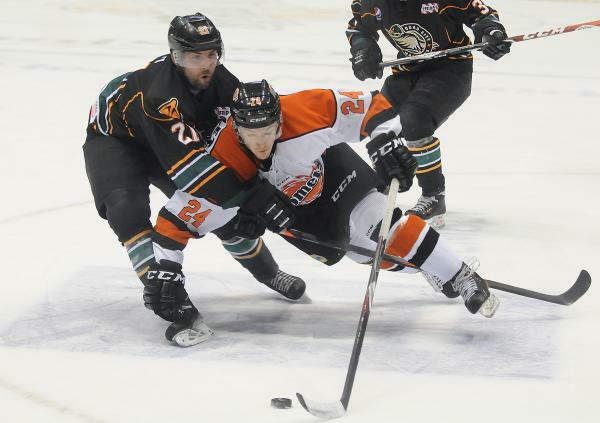 The last goal for Quad City was an empty netter, but before that one the Komets had given up six goals on 28 shots. The "defense" was just terrible. The forwards didn't help out, the defensemen were slow in getting their man and removing the puck from the zone, and the goaltender looked as if he didn't know what had hit him. The Komets are a very good team. They are very much more talented than Quad City. But a talented team that hardly works will always get beat by a lesser team that works hard. All the excuses have left the team (just like the patrons left the building last night wondering why they would want to come back ). They haven't put together really good games in a long time. Maybe they've read too many press clippings or have been mesmerized by the standings. Maybe they felt that since they've finally come home for a few games other teams would just bow down at their feet. Maybe they felt that a "CHL" team would be easy pickings. Whatever is going on, the time to wake up is now...and not just for the next game or two, but for each and every game here on out. This is a very good team. It has a lot of championship qualities in its makeup. And while I am very sure they will make the playoffs, I also believe they will not win the division. Not with the effort I've seen during the last four or five home games. It seems a shame that you get goals from Perlini and Beaupre, and still lose the game. Five goals should win every game they play, and while I will be at each game, it seems a shame when an effort like that may discourage walk ups for the future. Well it's on to New Years Eve with Indy. Most likely there will be about 8, 000 or more at the game. A terrific time to spit the bad "taste" out. But what about after that? It's up to the boys...and Graham. Being an old fart about hockey. I think the coach should just cut his comments down when the team turns in a loosing ugly performance. The players know it, the fans saw it, and the reporters reported it. So to throw more dirt on top starts to form a mountain. The players never call out the coach for a poor game plan or making adjustments between periods and they never should. I was not at the game so I counting on media reports and the coaches quotes. I will leave it at this, game prep includes all players and coaching staff..
Great comment Ed Rose, and I agree with you too Alan.